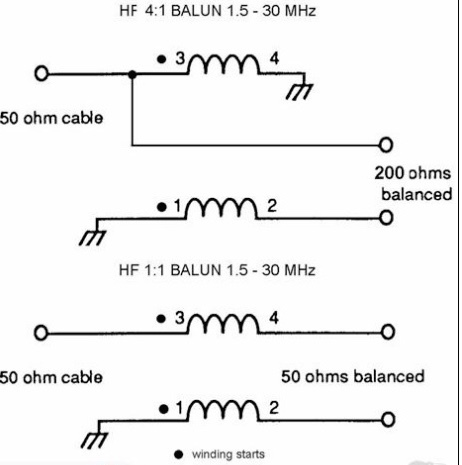 Baluns may be would in all sorts of configurations to change impedances and change input/output line feeds. One of the two most popular baluns are the 50 Ohm Un-balanced to 200 Ohms balanced configurations. The other is the 50 Ohms un-balanced to 50 ohms balanced configuration. The first balun 50 Ohms to 200 ohms are often used to feed Of Centre Fed dipoles and G5RV and antennas while the second balun 50 ohms to 50 ohms simply provides a match and keeps RF off the feedline. Both configurations require the same initial toroid and windings to cover to HF bands from 3 t0 30 Mhz with little actual loss. One toroid wound the same but connected differently for two different applications. 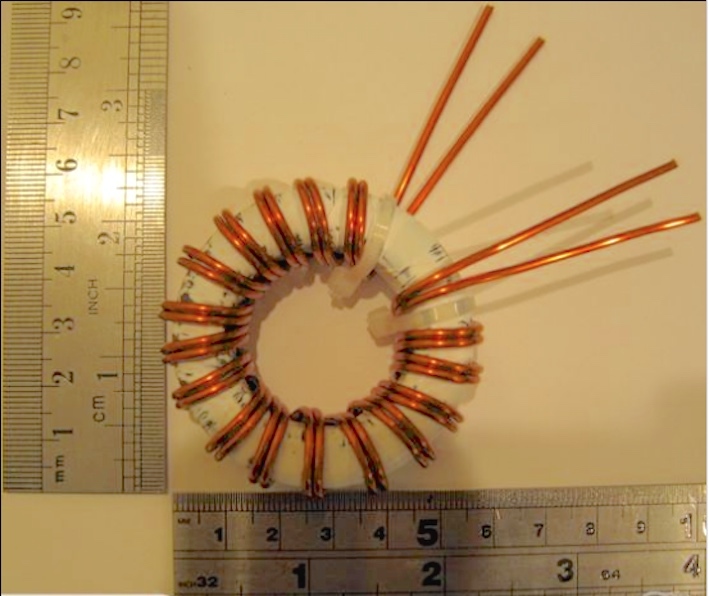 The photo shows how the windings are wound on the toroid which must be robust enough to handle 1KW and be wound with fibreglass tape to prevent the copper windings digging in on the edges of the toroid and shorting a few windings or arcing into the ferrite toroid under higher power transfer. The finished toroid Balun ready to to be sealed in it’s plastic box and connected into the dipole antenna. This particular version used 16 Turns of #14 wire evenly spaced around the T-43 ferrite core. The core was 55mm in diameter and 20mm thick. Amidon in the USA and many other suppliers around the world sell them. The finished balun should be put into a suitable plastic box sealed from weather and rain with suitable connections to each leg of the dipole and and with an SO-239 socket for the coaxial feedline. Baluns are not difficult to wind and are very much less expensive than buying a commercially made unit. This entry was posted in Amateur Radio General, Amateur Radio Technical, Antennas, Construction Projects by Lee. Bookmark the permalink.